Contact us for custom orders. We also sell bare (standalone) meters to existing ChromaPure users. Display 3 PRO orders include a free Calibration Accessories Bundle. ChromaPure's for calibrating TVs/projectors. If you also want to automatically calibrate PC/Mac monitors, make sure to also purchase the $29 upgrade to the retail (boxed) meter. It includes the necessary software from the meter manufacturer. See further below. Same as ChromaPure Standard but adds support for the AccuPel 3D video and DVDO AVLab TPG 4K (Ultra HD) test pattern generators without having to upgrade to ChromaPure Professional. Includes licences for two (2) meters. Includes unlimited licences for all supported meters and all advanced features including Auto-Calibrate. Allows anyone with little or no training in video technology to fully calibrate their display with almost no user input. Calibrates at 6 colour points. Duo video processor required. Same as Auto-Calibrate but increases calibration from 6 to up to 4913 colours, achieving unparalleled colour accuracy. Radiance video processor required. ChromaPure Standard and Plus include licences for two (2) meters by default. ChromaPure plus includes unlimited licences. Upgrade is FREE if you purchased ChromaPure after December 17, 2014. Already own a competitor's product and ChromaPure Standard? Contact us for a discounted upgrade price. Auto-Calibrate allows anyone with little or no training in video technology to calibrate their display with almost no user input. iScan Duo required. Calibrates at 6 colour points. Advance Auto-Calibrate adds calibration of up to 4913 colours distributed throughout the gamut achieving unparalleled colour accuracy. Bundle with a Radiance Pro and pay only $280! Already own a competitor's product? Contact us for a discounted upgrade price. For connecting the PC running ChromaPure Auto-Calibrate to a Radiance 2020 video processor. Not required with the newer Radiance 21xx/4xxx series. (Not available for sale separately - Must be purchased at the same time as a meter). * Includes software from the meter manufacturer to automatically calibrate PC/Mac monitors. Supports 2 lb max instead of 1 lb. Useful if you have other heavier meters. You pay for shipping to us and for US customers we pay for shipping back to you. ChromaPure licence required (not included). Adds one new correction mode to a Display 3 PRO without recalibrating the entire meter. Available for existing ChromaPure Display 3 PRO meter users only. New customers get all available correction modes at the time of purchase. Recalibrate your Display 2/LT, DTP-94, Display 3, Spyder3, Chroma 5, Hubble, or K-10. You pay for shipping to us and for US customers we pay for shipping back to you. ChromaPure licence required (not included). Most US orders ship USPS Priority Mail and international orders ship USPS Express Mail. For exact shipping costs click BUY NOW and enter your location. International orders may include extra import duties and/or taxes according to the laws of the target country. Contact us for custom shipping. We've worked out an exclusive deal for our members to bring you these ChromaPure packages at prices lower than anywhere else on the internet. Buy direct from our ChromaPure partner at prices lower than buying off their own website. Same product, same support, just more money in your pocket at the end of the day. ChromaPure is very easy to use calibration software designed by experienced professional ISF certified calibrator Tom Huffman. Doesn't matter if you're new to calibration or a seasoned professional, ChromaPure provides all the features you need, including advanced features not found in any free software. Support for life is included. There are no yearly maintenance or support fees. Unlike some other calibration packages, none of our meters are locked to only work with the software it was sold with. CurtPalme.com are calibration experts and authors of popular free calibration guides. We live and breathe calibration. No matter what your needs we can assist in choosing what's right for you. We offer products for the budget DIY'er all the way up to the seasoned professional, all at CurtPalme.com discounted prices. ChromaPure offers a simple, easy to use interface that will be familiar to anyone who has browsed the world wide web (see screenshots and videos further below). ChromaPure was designed especially with modern colour management systems in mind. To facilitate quick, easy, and accurate calibration of a display's colour, you must be able to display in real time the lightness, saturation, and hue of each of the primary and secondary colours. User-selectable DeltaE formulas for accurate and flexible analysis of colour accuracy. Real-time analysis of lightness, saturation, and hue of primary and secondary colours in % error and DeltaE. Watch the values change as you make adjustments. User-selectable colour luminance targets. Use fixed targets from selected gamut or calculated targets from measured primaries. Raw xy data for greyscale tracking. DeltaE and CCT analysis of greyscale tracking. Point-by-point RGB data for greyscale tracking. Raw xyY data for primary and secondary colours. 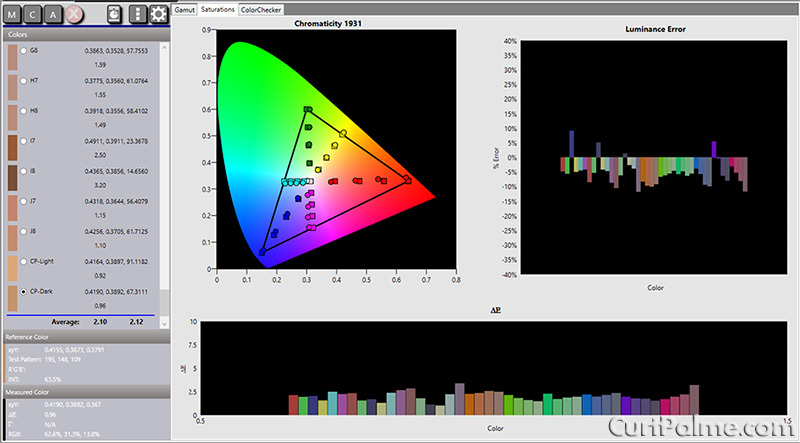 DeltaE analysis of primary and secondary colours relative to the user-selectable gamut. Click here for a sample detailed report. How do I purchase ChromaPure? ChromaPure software can be downloaded here. To use the software you need a licence which is purchased through the bundles or software purchases on the right. A licence and installation instructions will be emailed within 24 hours of purchase. If the purchase is made during business hours (US Central Standard time), licence and installation instructions will arrive before close of business, often within the hour. If you are ordering a software/meter bundle, then the licence will be e-mailed to you along with installation instructions when the meter ships. Automatic calibration allows anyone with little or no training to fully calibrate their display with almost no user input. It adjusts the display's grayscale, gamma, and colours to levels of accuracy that are simply not achievable by manual methods. Just setup a few simple options in ChromaPure software, click "Auto-Calibrate", and then go have a cup of coffee while the process completes, usually in a few minutes. There is no need for the user to understand how calibration works. It is suitable for all display types. This feature is an optional add-on to ChromaPure Standard, and it works in conjunction with a DVDO Duo or Lumagen Radiance external video processor. The processor acts as both a test pattern signal generator and calibration device. The Auto-Calibrate software controls the processor and the color analyzer to get the most out of your display. It will even generate a before and after calibration report for you. The display's performance with respect to each of these parameters is presented in colourful charts and precise numerical values, both of which can update in real time as calibration adjustments are made. 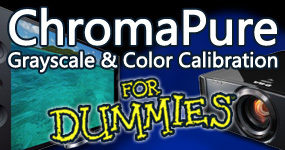 Auto-Calibrate is available to ChromaPure Standard users at a CurtPalme.com discounted price. It is free for ChromaPure Professional users. ChromaPure Professional users should contact us to enable this option. See our ChromaPure Automatic Calibration packages page for more information. PC or laptop running Microsoft Windows 7/8/10 and ChromaPure 2.3 or higher. DVDO Duo or Radiance video processor connected to the PC via a USB to RS232 serial cable (DVDO Duo or older Radiance models) or USB cable (newer Radiance models with USB ports). Advanced Auto-Calibrate includes the same features as Auto-Calibrate but instead of only calibrating to 6 colours, it calibrates up to 4913 colours distributed throughout the gamut achieving unparalleled colour accuracy. A supported color analyzer (We strongly recommend a fast and accurate meter, such as the Display 3 PRO, or X-Rite Hubble, or Klein K-10). Lumagen Radiance (any model) external video processor with the supporting firmware installed connected to the PC via a USB to RS232 serial cable (older Radiance models) or USB cable (newer Radiance models). Most modern PCs will require a USB-RS232 adaptor if using an older Radiance that has a serial port (no USB). The DVDO Duo is not supported. What meters does ChromaPure Standard support? *Unlocked versions only. Some vendors lock their meter such that it may only be used by the software it was sold with. Contact us for a utility to test if your meter to see if it's been locked. The meters we sell are never locked. ChromaPure Standard includes two (2) meter licences in the base price. A separate licence must be purchased for any additional meters you may wish to use. What meters does ChromaPure Professional support? ChromaPure Professional includes an unlimited number of meter licences. Subscribe to our newsletter to stay informed as new meters are added. What signal generators does ChromaPure Standard support? What signal generators does ChromaPure Professional support? Contact us about bundling colour meters and signal generators. Subscribe to our newsletter to stay informed as new signal generators are added. How is ChromaPure Professional different from ChromaPure Standard? Support for high-end color analyzers. Support for high-end signal generators. Licencing for professional use. This includes any use in which the software will be included in for-profit activity. Licencing for an unlimited number of meters. To add a meter, simply contact us and we will update your licence free of charge. Support for individually customized Excel-based reports. Just tell us what charts, graphs, and company information you would like and we will update the software to include this. Licencing for Duo/Radiance auto-calibrate is already included at no additional cost (advanced auto-calibrate is still extra). Auto-calibrate lets Duo and Radiance owners click a button in ChromaPure and have their display be calibrated completely automatically. It's really that simple. How is ChromaPure Lite different from ChromaPure Standard? ChromaPure Lite is intended for beginners and does not support: Gamma, Advanced Color Management, ColorChecker, Reports, Auto-Calibrate, Lumens Calculator, Conversion Utility, PRO meters, or Signal Generators. ChromaPure Lite includes one (1) meter licence in the base price. A separate licence must be purchased for any additional meters you may wish to use. Users may start with ChromaPure Lite and later upgrade to ChromaPure Standard. Why buy two meters instead of one? Often users will purchase both a colorimeter (ex: Display 3) together with a spectroradiometer (EyeOne Pro 2) to get the best of both technologies. The combination of the EyeOne Pro / EyeOne Pro 2 together with either of these colorimeters offers excellent accuracy, speed, and low-light sensitivity and is suitable for professional calibrations. For more information see our EyeOne Pro 2 order page. Yes. Point upgrades will be offered to licenced users for free. These upgrades will generally include only small changes and bug fixes. New versions will be offered to licenced users at a substantial discount. New versions will include major new functionality, and will not be merely cosmetic. Do I have to pay extra for ongoing technical support? No. As a licenced owner of ChromaPure, you are entitled to lifetime free e-mail technical support. Do I have to pay annual maintenance fees? No. There is no annual maintenance fees for ChromaPure Standard or Professional. The only fee you will ever incur is if you wish to purchase new versions of the software, such as upgrading from version 1.x to version 2.x. Can I purchase meters separately? How many meters can I use at the same time with ChromaPure? There is no cost to change what meters you have licenced for use in ChromaPure. Contact us to change your licence for free. If you wish to add additional meters beyond the limits above, the cost is $90 (CurtPalme.com discounted price) for each additional licence, plus the cost of the meter (if you are purchasing an additional meter from us). ChromaPure Professional supports an unlimited number of meters. No extra licences need to be purchased. Can I replace my current meter without incurring any additional licencing costs? Yes. If you merely want to get a new meter the only cost to you is the meter itself. There is no additional licencing fee to switch over from one meter to another. Contact us to change your licence for free. Yes. Contact us to change your licence for free. May I use my copy of ChromaPure for commercial purposes? Yes. A ChromaPure Professional licence is required for commercial use. Yes. The Professional version adds support for high-end colour analyzers, high-end signal generators, a licence for an unlimited number of meters, customized reports, and licencing for Duo/Radiance auto-calibrate (also available in the Standard version as an optional add-on). Yes. You can install the software on as many PCs as you like. However, you can only use it with the meter(s) that it is licenced with. Not at this time. However, we are constantly reviewing market conditions so this may change. ChromaPure does run fine on a Mac using Windows emulators such as Parallels Desktop or a split partition using Boot Camp. Is my ChromaPure licence transferable? Yes and No. Yes in the sense that you are free to sell your copy to someone else if you like. However, "no" in the sense that it will still only function with the meter(s) it is licenced for. If you wish to transfer a fully functional version, it must be bundled with the licenced meter(s). US orders generally ship USPS Priority Mail. International orders generally ship USPS Express Mail. For exact shipping costs, use the BUY NOW buttons above to add items to your cart and enter your address. International orders may include extra import duties and/or taxes according to the laws of the target country. Contact us for custom shipping. Can my meter be recalibrated? Yes*. For a modest fee, your Display 3, Display 2/LT, DTP-94, Chroma 5, or Hubble colorimeter can (and should) be periodically recalibrated to ensure it retains its initial accuracy. This service eliminates the problems associated with exposure to the elements over time. We can recalibrate any of these meters (not just the ones you purchased through us) for use with ChromaPure. A ChromaPure licence is required to use the PRO meter. Subsequent recalibrations are then available as the meter ages. We recommend doing this yearly. See our BUY NOW buttons to the right. You pay for shipping to us and for US customers we pay for shipping back to you. (International customers pay shipping in both directions). *Not all Chroma 5's may be upgraded/recalibrated as some vendors lock or modify their Chroma 5's to only work with their software. See our Chroma 5 page for details. Can I calibrate 3D with ChromaPure? 1. The test patterns must invoke the 3D mode on the display. We do not know of any Blu-ray test discs that include 3D patterns as of this writing (March 2012). The AccuPel video pattern generator has three different 3D modes (frame packing, side-by-side, and top-to-bottom). When the display detects one of the test modes, it automatically goes into its 3D operating mode. On some displays 3D mode can forced regardless of the signal. The Radiance video processor may also be used as it has some 3D test patterns available. 2. Place the 3D glasses in front of the meter and calibrate as you would normally. Adjusting Greyscale with the Lumagen Manual Control Toolbar. Adjusting Color with the Lumagen Manual Control Toolbar. Adjusting Grayscale and Gamma with the DVDO Duo Manual Control Toolbar. Auto-Calibrate: how to calibrate your display automatically using an external processor. Quick Reports: How to generate a quick and easy report documenting the pre and post-calibration performance of your display. Correcting a Meter's Performance with a Reference Device: How to correct the response of a field meter using a reference device. Using Advanced Color Management: How to measure the entire spectrum of color of a display. Using an External Signal Generator: How to setup and use an external signal generator. Using a Color Management System (CMS): How to measure and calibrate the color of a display. Analyzing Raw Data: How to analyze raw xyY data using several metrics of color science. Measuring and Calibrating Gamma: How to measure and calibrate the gamma response of the display. 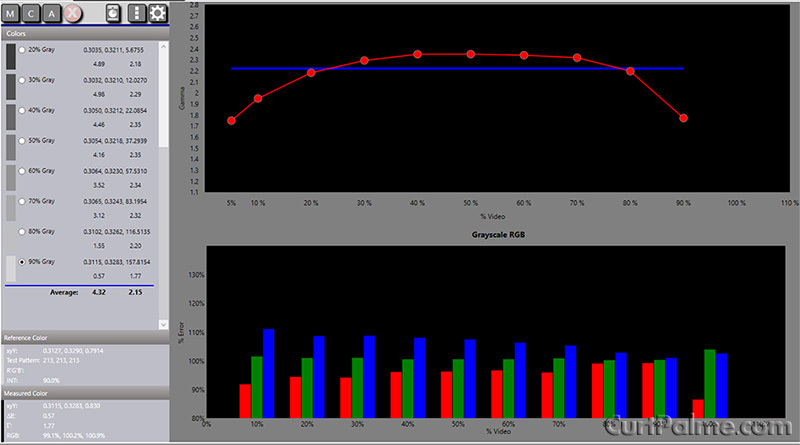 Taking Greyscale Readings: How to measure and chart the grayscale performance of the display. Taking Colour Gamut Readings: How to measure and chart the color gamut of the display. Calibrating White to D65: How to calibrate the white balance of your display. Measuring Contrast: ChromaPure allows you to measure the sequential (On/Off) or simultaneous (Checkerboard) contrast. Importing and Exporting Data: How you can share data with others. Running a Calibration Report: ChromaPure includes a comprehensive printable report. Selecting Options for a Calibration Session: How to choose preferences for your calibration. Getting Help: How to use ChromaPure's context-sensitive online help. While there is no native Mac OS X version of ChromaPure, it does run fine on a Mac using Windows emulators such as Parallels Desktop or a split partition using Boot Camp. ChromaPure 3 user manual (PDF format). ChromaPure 2 user manual (PDF format). All ChromaPure customers are entitled to lifetime e-mail technical support. All technical support issues will be handled through email. Before submitting a technical support request, make sure that the issue is not addressed by the Help file included with every installation of ChromaPure or in the FAQ listed above. "I just wanted to send you a quick email from my work address thanking you for your help ... I was able to grab the software from the address you posted it to and do a quick test on everything last evening. Great software. Simple to use and understand. Works well with the EyeOne." - Kevin F.